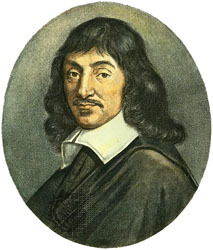 About a year ago, I posted a poem that I wrote for an assignment, all about Rene Descartes, one of the most influential philosophers of all time. Mostly because I was out of town. Well, it’s been a really busy week, but I couldn’t just post a poem again. That’d be cheap. So I bring you the Descartes song! Real music about everyone’s favourite French philosopher who isn’t Rousseau. Or Sartre. Or Foucault. I’ve posted the lyrics below the song. Enjoy! Also, apologies for crappy webcam mic. a great drunken Frenchman by the name of Descartes. so he sat in his chair and he thought it all through. casting aside all things open to doubt. he cast aside old cars with no power steering. noodlers and knobblers, not a thing held in place! a boring, spectacular, philosophy show! 17th Century philosophy, find out what it means to me. If you want to get with me, separate your mind and body. Dualism is the key to my heart. got rid of all adjectives and every last noun. “What am I left with?” he asked with a sigh. the very one thing on which he relied. Himself, great doubter and thinker renowned. His mind, ephemeral and a little unwound. and bereft of his senses his mind would endure. That’s when he posited a great explanation. A Cartesian idea, mind/body separation! causing states in the other, bound by pineal glue. However, this raises a substantial critique. How are they separate? They seem quite combined. but with a causal relation, that simply can’t be. obeying whims of the senses and all the causes around. There is one final problem which I must pursue. If my mind’s incorporeal, what does my brain do?